It's been a while since I did a food diary. I love seeing what other people eat on a daily basis, so I assume there's more people who'd like to see this! This time, I tried my best to capture my meals with my camera instead of my phone, so the quality is better. Let me know in the comments if you'd like to know more about one of the meals... enjoy! Small salad with arugula, plum tomatoes, mozarella and some seeds (Omega 3 from Holland and Barrett). A nice little Italian pasta on the ski-slopes. Blood oranges look so cool! I wish they were available all-year round. Blood orange, raspberry and banana smoothies after a long day of skiing. Back to London, back to my own cooking. I usually put minimal effort into my meals but like to have everything frehsly made. 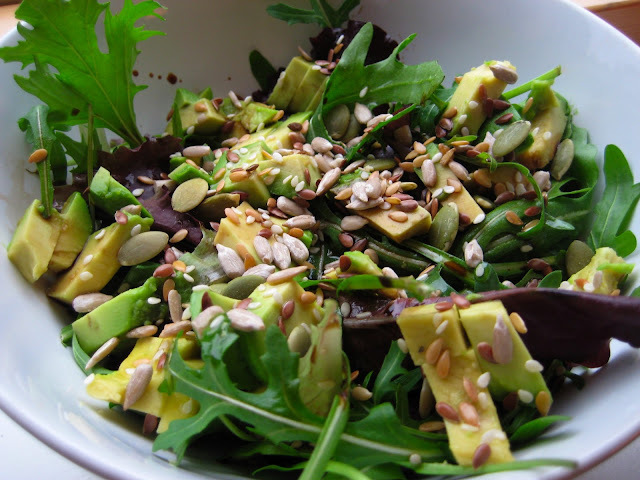 Here's another simple salad with mixed salad leaves, avocado and some mixed seeds. I always make my own pizza from scratch. It's so simple to make and doesn't take me more than 30 minutes (including oven time). I usually include: mozzarella, tomato sauce (passata), Milano salami, some small tomatoes, pepper and rosemary and sometimes arugula on top. Last weekend, we decided to go to the Breakfast club, which resulted in a hour (!) waiting time. I was planning on writing a full review on this but I was more than disappointed with the food and the service. Maybe it's good when you don't need to wait outside for an hour, but otherwise I'd say skip it, it's not worth the hype. The orange juice was really good though! Bacon pancakes, french toast with apples (the french toast was dry inside and the apples too sweet) and huevos rancheros. I'll still be on the hunt for the perfect breakfast spot! My favorite breakfast: green tea, fresh smoothie and porridge. I wrote about it here. Favorite chocolate fix: cornflake clusters. Super simple to make and no added sugar! Check out my recipe here. Another great way to start the day: a big fruit salad. I don't make this very often because it takes some time to make. But so worth it, I must do this more often! This bowl contains one banana, one kiwi, a few frozen raspberries, one orange and the juice from one orange. 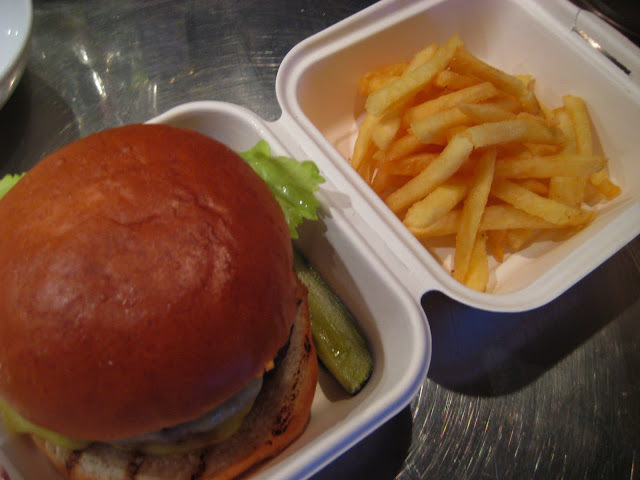 My first take-away from the new Byron that opened up near me. I LOVE BYRON. The burgers are simply amazing. But there's one little remark: when I get take-away, the portion of fries is always smaller than I would get if I were to sit down and eat in the restaurant. A little disappointing, especially for the same price. I want more fries!